Ridom SeqSphere+ Software is designed for distributed work-groups (client/server model) and allows automatic processing and analyzing of NGS (e.g., Illumina, Ion Torrent, or PacBio) and Sanger capillary- electrophoresis (CE) sequence data. SeqSphere+ is the single solution for easy and automated microbial analysis; enabling your lab to employ whole genome microbial typing (cgMLST), rMLST, or traditional MLST sequencing projects (Nat Biotechnol. 2013, 31:1148 [PubMed]). Ridom SeqSphere+ includes every tool that is needed to do bacterial typing with whole genome shotgun (WGS) data. The software works directly with the short-read FASTQ files produced by a NGS sequencer. A pipeline mode allows to import, assemble and analyze hundreds of read files without any user intervention. cgMLST schemas for outbreak analysis can be downloaded for many species from the public cgMLST nomenclature server. Phylogenetic and minimum spanning trees can be easily created using the software. A variety of methods have been developed to generate isolate-specific fingerprints for epidemiological typing. However, until now there is no single typing method available to address different bacterial population structures (monomorphic vs. panmictic) and all study types (e.g., evolutionary/phylogenetic, population genetics or transmission chain/outbreak investigation). For decades, the common typing method is based on multi locus sequence typing (MLST) of 5-7 housekeeping genes or pulse field gel electrophoresis (PFGE) and multi locus VNTR analysis (MLVA). Although widely adopted, these methods either lack discriminatory power or are labor intensive and difficult to standardize. Now, microbiologists everywhere can experience the genomic revolution that benchtop next generation sequencing (NGS) provides. With fast affordable microbial whole genome shotgun (WGS) next generation sequencing and automatized software analysis, microbiologists can use genome-wide hundreds/thousands of genes (cgMLST) for typing, resulting in higher discrimination and more accurate strain typing. Listeria monocytogenes: JCM 2015, 53:2869 [PubMed]. Figure. 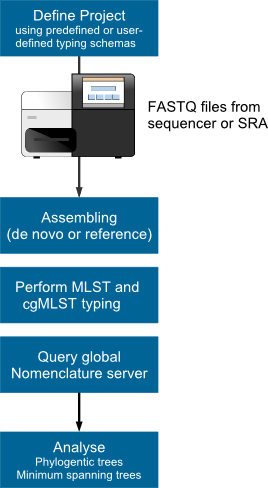 Microbial WGS next generation sequencing and genome-wide gene by gene (cgMLST) analysis workflow.